This humble substance, sodium bicarbonate, has an amazing array of uses for beauty care. It is inexpensive and can be purchased just about anywhere. So it's worthwhile to know some of its applications! Did you know that baking soda and water alone make an excellent shampoo? It helps remove build-up caused by hard water or styling products. Mix about 1 teaspoon of baking soda to one cup of warm water. Add a drop of essential oil if you like. Pour over your head, work with your fingertips, and then rinse well. There is no need for conditioner; the baking soda mixes with your hair oil to make a gentle, conditioning soap. You can also add 1/4-1/2 teaspoon of baking soda per tablespoon of your regular shampoo. If you don't have time to wash, just sprinkle dry baking soda onto your hair and brush it through. Or, put it on your comb or brush and work it through your hair, taking care to get it down to your scalp. It actually mixes with your hair oil to form a cleanser, which gives the impression that it is “absorbing” the oil. You don't need expensive exfoliants to give your skin a healthy glow. If you have thick, dry skin on your heels, knees, or elbows, mix baking soda with water in a 3-to-1 ratio to make a thick paste. Rub this paste into the dry skin areas after your bath (when the skin is softened). After rubbing it in thoroughly, rinse well and apply a moisturizing lotion. Baking soda helps slough off calluses and tough, dry skin. Mix about a teaspoon of baking soda per one cup of warm water to make a facial wash. Swirl it around or shake it well; baking soda tends to sink to the bottom of such mixtures quickly. You might want to put the solution into a bowl and scoop it up with your hands. Gently rub it into your skin and rinse. Nowadays, toothpastes boast the presence of baking soda because it is so well-known as a good tooth polish. Why not skip the commercial toothpaste and go right for the good stuff? Here are some suggestions for home-made tooth powder or paste using baking soda. 1. To a tablespoon of baking soda, add one drop each of neem oil, tea tree oil, and peppermint oil. Mix with water to make a paste-like consistency and use for several brushings (using a dime-sized portion each time). 2. Just mix a tablespoon of baking soda with a few drops of peppermint oil, stir or shake well to combine, and use as a tooth powder. To do this, pour about a teaspoon of the powder into your palm and dip your toothbrush into it. You can also use plain baking soda as a tooth powder. 3. 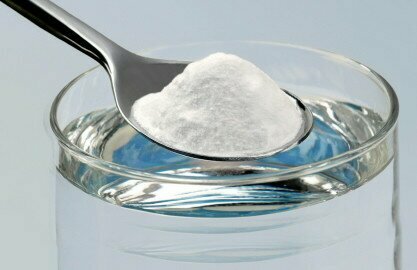 Mix a teaspoon of baking soda with 1/4 teaspoon of hydrogen peroxide and 1 drop of peppermint oil to make a thin paste. Baking soda can do wonders for the skin. Pour half a cup into your bath water to soften dry skin and soothe rashes and skin irritations, including sunburn. To learn more about how aging occurs and ways to slow down your biological clock, visit Xtend-Life's Overview of Anti-Aging research page today. Why do we promote this?